BASIS-VEX takes on VEX-Worlds 2017! 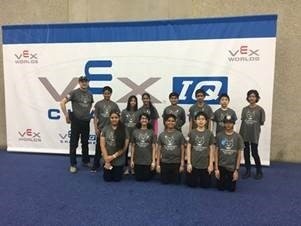 Last weekend, the BASIS VEX-IQ team traveled to Louisville, Kentucky to take part in VEX-Worlds 2017. VEX-World is an international spectacle and competition, with students hailing from Beijing, British Columbia and Boston alike. Of the 36,000 teams who hoped to earn a spot at the VEX-World 2017 competition, only 306 were invited to the event-one of which being our own BASIS-VEX team. Sohum A., Taarini D., Naina G., Arhan J., Nick M., Mahati, M., Annette M., Sujay R., Vinay S., Vishwa S., Isita T., Cyrus W.
To start off the unprecedented experience, each team was tasked with nominating one of their collaborators to represent them in the Parade of Nations during opening ceremonies. California was represented by 17 teams, all from different regions across the state. BASIS-VEX nominated both Sujay R. and Isita T. to walk in the parade, although Isita was the team's ultimate choice. Isita T. had the pleasure of representing California, the United States, and of course the BASIS-VEX team. BASIS competed as a VEX IQ Challenge Middle School Engineering Division Team, and while they didn't place in a top spot; Dr. Ghafooripour was so proud of his team members and how they conducted themselves at such a high stakes match. As he shared their accomplishments with the faculty and administrative staff back home at BASIS Indpendent Silicon Valley, he gushed that the students "worked together, respected each other, studied hard, maintained professionalism and ethics, and were able to work with other teams who spoke a different language." What an amazing group of students who were able to participate in a thrilling experience-we are certainly proud of their accomplishments as a team this school year! Please click the links to learn a bit more about VEX Robotics or The Robotics Education & Competition Foundation. You can catch the televised matches airing on CBS on June 11th-please check your local listings for channel information. BISV VEX IQ Robotics team was awarded Best Engineering Design!